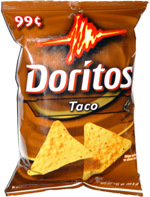 Colorwise, the chips didn't look much different from Nacho Cheese Doritos. The taste was pretty good, with a tangy but fairly mild taco powder seasoning, a taste that went well with the high level of crispness in the chips. Not the strongest or best flavor of the various taco-flavored snacks that we've sampled, but still a solid effort by Doritos. Smell test: Just a mild taco powder smell.